This driver is game ready for Star Wars: Battlefront II and Injustice II. 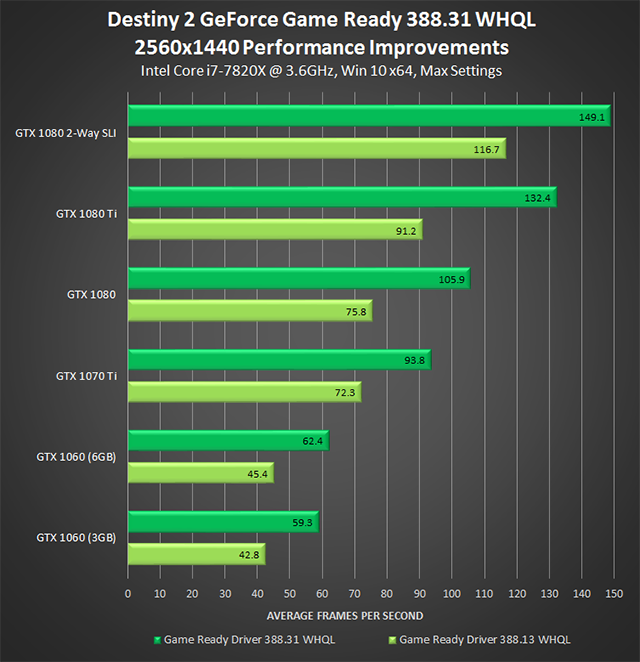 Read more on Nvidia's Geforce 388.31 driver. I can't wait to see this debunked, or at least rationalised and normalised by someone outside of Nvidia. Of course, if it's true, AMD just lost its Destiny 2 lead which is a big deal because online games are a big deal. Nvidia beats AMD in PUBG, the most popular game right now. But AMD beats Nvidia in BF1, another really popular game. hmm I'm normally one to call BS on all Nvidias claims with their drivers, including the jump from DX11 to 12 etc. However I did gain 19FPS in D2. So could be merit to this truth. As poster above said, about DoF... I do have mine cranked to full so that could be why. I can't see a 40FPS gain on a 1080 Ti with a simple driver update, Will wait for user testing. Same here. But I certainly see a decent gain. To me this smells of no optimisation and even under optimisation of drivers from the start and then an actual optimisation phase to bring drivers up to where they should have been in the first place so now they can say "look at how hard our driver team worked". I just really don't trust devs on any side especially marketing like this. I wouldnt be surprised if the devs are on point with this and more realistic. But when its handed over to marketing, they skew it as much as they can, so they can claim "50%" increase. This is something that I will put to the test later today. See exactly how much things change across all of the game's graphical presets. One thing to note is that this game can get CPU limited in a lot of places at 1080p, so the performance gain will be very limited at lower resolutions. As mentioned above. If possible, please add the Field of View into the test to see if this has an effect. I'll play with it later too. Although I don't really want to revert my drivers back just for this. I saw an increase... "for once" so I would like to just keep it as is.